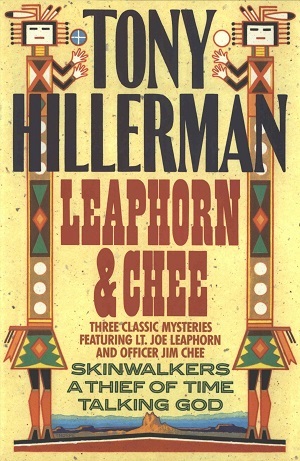 This is the first hardback edition of Leaphorn & Chee: Three Classic Hillerman Mysteries Featuring Lt. Joe Leaphorn and Officer Jim Chee. This is an anthology of the three novels featuring both Lt. Joe Leaphorn and Jim Chee in the Navajo Mystery Series and include: Skinwalkers (1986), A Thief of Time (1988), and Talking God (1989). This edition was published in 1992 by HarperCollins Publishers in New York City, New York. The cover art was illustrated by Peter Thorpe and features a Southwestern landscape and is bounded on two sides by two tall sand painting stylized yei figures each holding a floating ball. Binding: Speckled oatmeal boards with red cloth spine and the author, title, the image of a yei head, and the publisher printed in gold on the spine.